Our flight was about to leave Kolkata … still it was hard to believe that we are really going there! 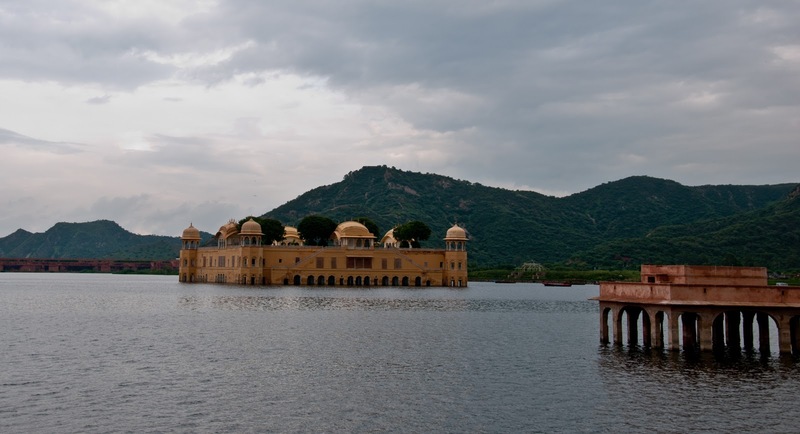 “Yesssss we are going to Rajasthan” – the place we always wanted to visit. We hardly had a sleep last night … last minute packing and excitement. With no specific plan in our mind we are going. We had our flight at 7:30 AM and we had reached airport almost 2 hours before. The flight was not delayed. After the take-off Kolkata started to look smaller and smaller from the window and at last disappeared behind the cloud and only then I felt Rajasthan is not far away! A short flight of an hour and 40 minutes and we were there in Jaipur. At the same point of time the city amazed me and disappointed me. I was amazed to see the Jaipur city from sky and from ground - a totally planned modern city. I was disappointed ‘coz I had a different picture in my mind. 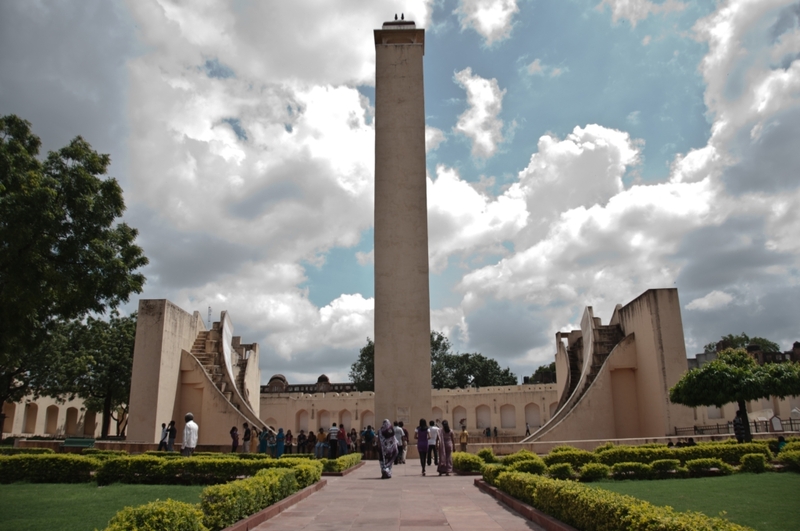 The old Jaipur city – “The pink city behind the wall” is almost 14 KMs away from the airport. The airport is smaller than I expected. We had hired an auto from outside the airport for 150 bucks. The auto rickshaw driver took us to some hotels. Almost all auto drivers do that to earn some extra bucks as commission. But I had a plan to stay in a heritage hotel. So we went to Diggi palace. Though the normal room rent was beyond our budget, but we had the advantage of traveling during off season. At last it was a good bargain and in the end I must say it was a good choice too. I expected Jaipur to be hotter than Kolkata, but the temperature and weather is quite similar, at least it seemed to be so, at the time we had visited. When we left Kolkata we were annoyed as it had been raining for almost two weeks. When we had arrived at Jaipur we are surprised to see the clouds followed us there too. The rain was not continuous and we had enough time to watch Jaipur closely. 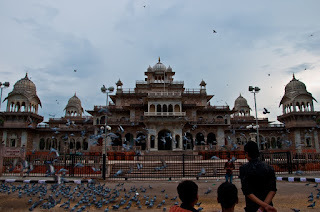 We were not in a mood to relax, and we wanted to explore Rajasthan as much as possible. So soon after checking in and having a bath we left Diggi Palace for a walk. I had map of the city with me, which I got from the hotel reception. With the help of that map and local people we started to explore Jaipur depending on our legs. Nahargarh* fort was visible from the road. The first fort we saw in Rajasthan. We decided to visit it by walking. Asking a few people and with the help of our map we have reached the fort. We had the best panoramic view of the pink city from this place. We spent a couple of hours there before coming back. During our way back we visited the famous “Hawa Mahal” and “Albert Hall Museum”. It was a hectic walk, almost around 20 Kms. When we came back to our room we decided not to stretch it anymore. The arrangement that night was really good. It was a full moon and a special day for Hindus – "Rakhi Purnima". Hotel management had arranged a cultural program on that occasion, folk music, folk dance and puppet show. A beautiful girl was dancing with rajasthani folk music. She was so damn beautiful that my total concentration was on her. It was a long night. I also had a good time with the singers. Folk music is one of my interests and Rajasthan is famous for the folk musician. Sufi, Ghumar, Kawali, Kalbelia - we had too much of the folk flavors that night. We went to bed around 1:30 A.M. It was late when we left our bed next morning. We hurried to finish our breakfast, had a shower and checked out from the hotel. We directly went to the bus stand in search of a bus to Jaisalmer to find out there is only one bus and that departs from Jaipur at 11:59 PM. That was good for us as we decided to spend the day exploring other parts of Jaipur. We took an auto again for hire and for 500 bucks we had a city tour. We started with Jantar-Mantar. The next was city palace, but it was so crowded that we decided not to enter the palace. From there we went straight to Amer Fort. 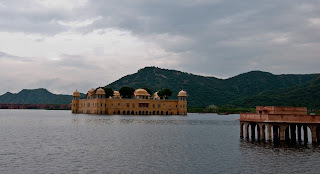 Amer is obviously the biggest and most beautiful fort of Jaipur, expanding around 5 KMs over Aravalli Mountains. The artwork is stunning, architecture is wonder. We didn’t have a clue how hours passed away within the fort. On our way while returning back from the fort, we went to another famous place of Jaipur, Jalmahal – “Lake Palace”. We went back to the bus stand after the tour. We we really hungry at that time and we decided to try something typically Rajasthani. So for the first time we had "Dal-Bati-Churma". Then it was a was a long waiting. We decided to go back to the walled city to pass time. Returning back to the city, we went to a football ground near the “Albert Hall Museum”. It was around 9 PM, a gentle breeze was blowing. I put my backpack down over the ground, put off my shoes and light a cigarette to enjoy that moment. Suddenly I couldn’t believe my ears! “Someone is talking in Bengali” … and I was so surprised to see almost all the people present there are talking in Bengali! At home feelings for us! We left that place around 10 and went back to the bus stand. Again some wait and we were inside a Volvo bus. The condition of the bus was not really good. But we were so tired that the condition couldn’t disturb our sleep that night. It was almost dawn when I opened my eyes. The terrain was different and I started to feel the desert. I was still in bus we had reached Jodhpur. The bus journey was a bit boring. Though you can enjoy beautiful Rajasthan from a window seat but it takes too long to reach Jaisalmer from Jodhpur, almost 12 hours. Our uneventful journey ended at Jisalmer around 12:15 P.M. and it was a kind of relief for me. Avoiding the annoying auto rickshaw drivers we left the bus stand. Due to heavy raining in last few days it was difficult to get a car there. After trying several times we got a vehicle in reasonable rate and we left for Khuri village. A road among deserts, many wind mills, not many people during the journey – seems like a western movie. It took us almost a hour to reach Khuri, 44 KMs away from Jaisalmer. But we really have enjoyed that journey. In Khuri we had a booking in “Badal’s house”. Badal Sing is a very nice person and In Khuri “Badal’s House” is one of the best options to stay. He charges 300 Rs per day including the food. That is quite good. We had a bath and had our lunch with "Bazre ki roti". Hey, liked your post on Rajasthan. An amazing state, right?